I love to take bike rides, it’s always been a favorite pastime of mine and I wanted Pinky to be able to join us on our summer bike rides. I knew she’d love to sit in a bike trailer with the wind blowing in her hair. 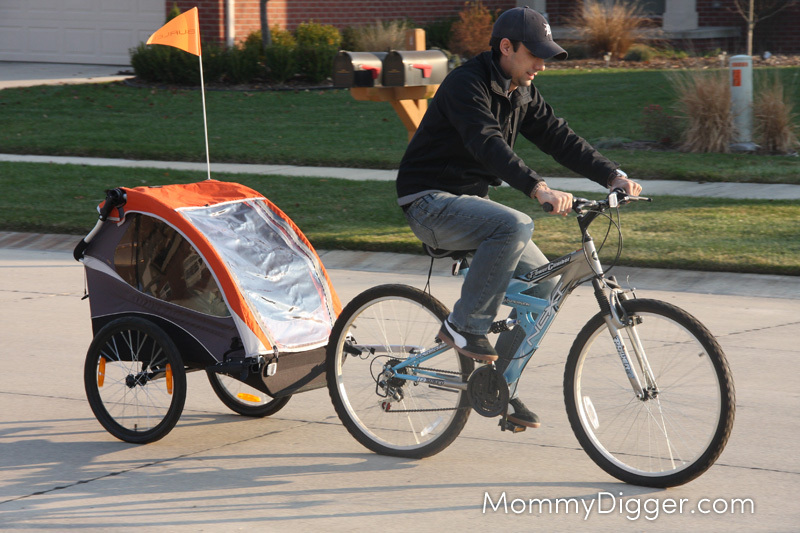 I had researched and found that the safest way to carry young children on a bike ride is a trailer and I was given the amazing opportunity to review the Burley D’Lite Bike Trailer. Needless to say we’ve been on many bike rides with it and I’m excited to share the great features with you! The Burley D’Lite is perfect for the occasional user or avid bikers and it can also be used as a jogging stroller when you purchase the 2 wheel stroller kit. It seats 2 children comfortably so I’ll be able to take both kids next year. The bowed out sides make for extra shoulder room so that when 2 are seated they aren’t cramped in. There is an internal roll cage so in the event of a accident the trailer for extra safety. It also has lots of reflectors on the wheels, trailer and a reflective fabric trim which is great for evening or morning bike rides. It has an Elastomer suspension system which means a smooth ride, and boy is it ever! It’s very easy to maneuver around with it even through our subdivision with tight turns and bumps with the construction that is going on. It’s also pretty light so your not lugging around lots of extra weight. For the kids comfort you can also recline the seats easily and the windows are UV protected. When the sun is shining on them you can adjust the sunshade. For those rainy days there is the rain shield that easily unrolls and zips into place. It has a shield for everything – bugs, rain and sun so no matter what the situation you’re ready for it and they easily zip or snap into place. Just the other day it was in the 50s so Pinky went for a bike ride with Daddy and we put the rain guard down because it is also great for blocking the wind if its a bit brisk. The seats are nicely padded and the 5 point-harness is padded as well so it’s perfect for a long relaxing bike ride. The seat pads and shoulder harnesses are even removable so that you for washing. Another favorite feature of mine is the mesh pockets on the inside for storing snacks, juice and toys. While it is one of the more expensive bike trailers available you can certainly tell why and being able to turn it into a jogger/stroller with the purchase of an accessory kit certainly helps to justify the cost. It’s built to last and handle any kind of biking or running you put it through. Bike rides have always been a favorite activity of mine and our Burley D’Lite trailer has been wonderful to have! Pinky can now enjoy bike rides with us in comfort and style! My daughter will be 8 in April and we just stopped using our bike trailer!! She loves to sit in it with her dolls and just take in the scenery. Can not tell you how bad I would LOVE a bike trailer!!! So jealous it looks like a great one!